Tom Corbett became Pennsylvania’s favorite politician for a day. 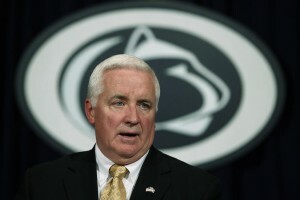 In a bizarre move that many are still struggling to completely understand, the embattled governor and Penn State trustee suddenly decided to fight the university’s unfair and unprecedented sanctions by filing an antitrust lawsuit against the NCAA. It came six months after the sanctions were imposed, and went forward without the blessing of the university. Perhaps most importantly, Corbett broke new ground during his announcement at the Nittany Lion Inn in State College this morning. He became the first member of the Board of Trustees to criticize the NCAA sanctions. He called the Freeh report “incomplete,” a mild attack that few other trustees, if any, have been willing to match thus far. And by using the Commonwealth’s Office of General Counsel to overturn the sanctions, he became the only prominent person to take any action against the injustice that was delivered to so many people as punishment for the ills of a few. Penn Staters everywhere are giving him a standing ovation today. But eventually we’ll sit down and remind ourselves of a few things. His administration has continued stonewalling my attempts to access records from the Secretary of Education, who was second in command of the committee that oversaw Freeh’s investigation. While Corbett wants to hold the NCAA accountable for its actions, he refuses to hold himself and his state appointees to the same standard. The same people Corbett tapped to file this antitrust suit are fighting attempts to make Corbett’s Penn State records subject to the Right-to-Know Law. My stomach churned as I watched James D. Schultz, the Commonwealth’s General Counsel, declare that the lawsuit was “the right thing to do.” Holding the NCAA accountable is apparently perfectly acceptable, but Corbett and his appointees are off limits. And we can’t forget his contribution to the mess in November 2011, as well as his July statement that said Penn State must “accept the serious penalties imposed today by the NCAA on Penn State University and its football program.” He admits no mistakes, but suddenly wants to fight what his missteps contributed to. I think I speak for all Penn Staters when I say we have mixed feelings about Corbett’s newfound defense of the university. We certainly applaud his efforts, especially when nobody else has been even remotely willing to stand up against Emmert’s gross misstatements that Penn State placed academics above athletics. But Corbett and his administration have a long way to go before I will declare they’re acting in Penn State’s best interests. They should start by holding themselves accountable, and take others to task after cleaning their own house.